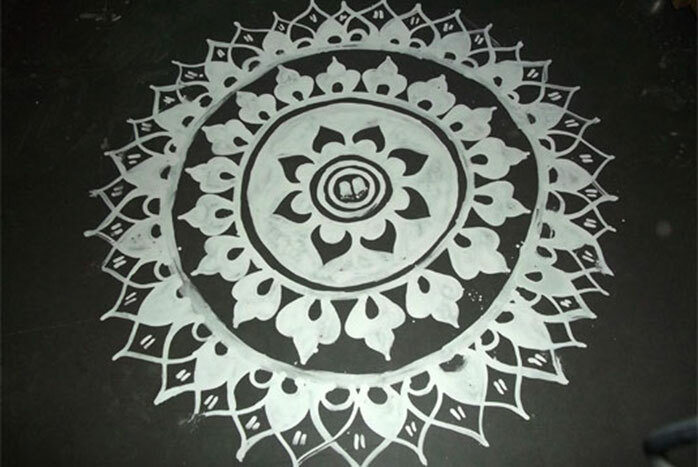 Jhoti or Chita is the traditional Oriya art on the floor and walls, very popular in the rural areas. Jhoti is quite different from rangoli. 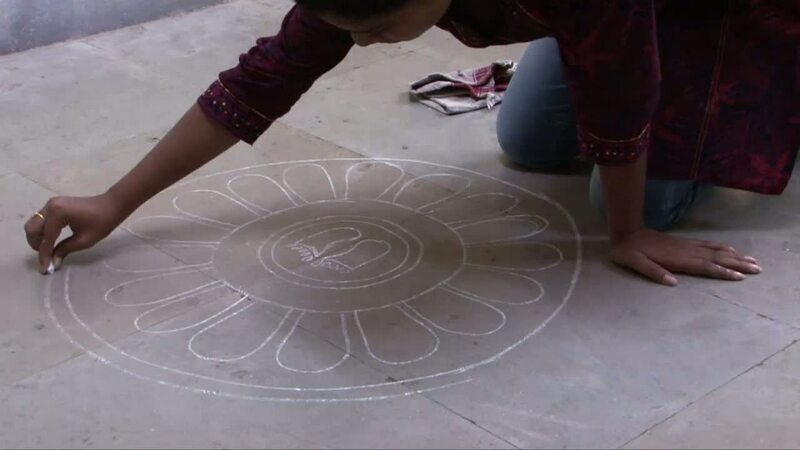 While rangolis are made using coloured powders, jhoti involves line art using the traditional white coloured, semi liquid paste of rice or pithau. The fingers are used as brushes in this art form. Intricate and beautiful floral designs, the lotus, elephants, symbols used in patta chitra find place in this form of free hand drawing. 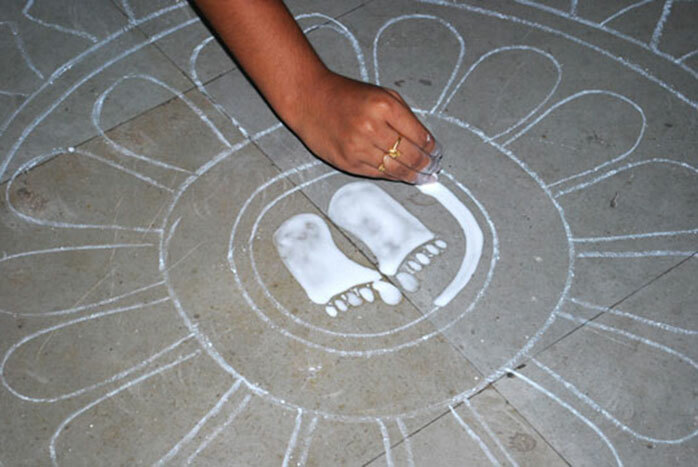 Small footmarks of goddess Lakshmi are a must in any jhoti. The jhoti or chita are drawn not merely with the intention of decorating the house, but also to establish a relationship between the mystical and the material, thus are highly symbolic and meaningful. Throughout the year, the village women perform several rituals for the fulfilment of their desires. 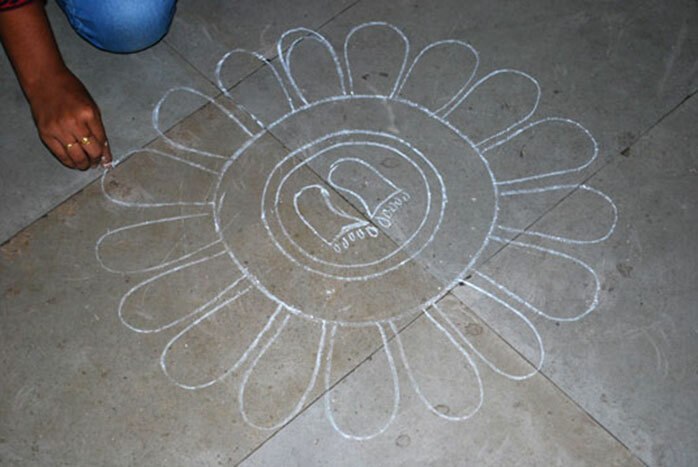 For each occasion a specific motif is drawn on the floor or on the wall. 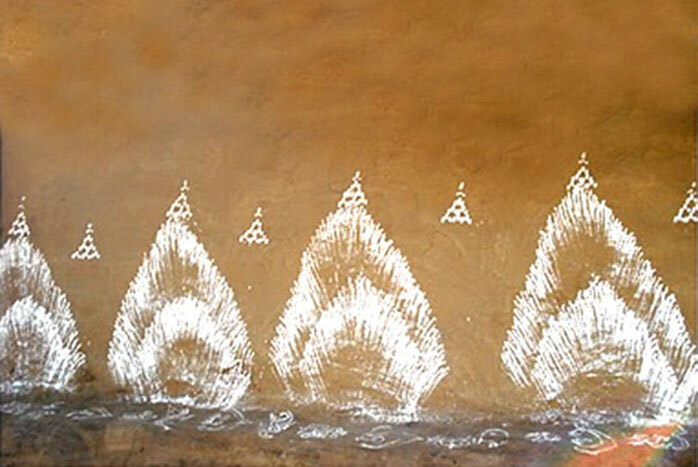 For instance, during Lakshmi puja a stack of paddy or rice sheaves is drawn on the walls structured like a pyramid. During Durga Puja, white dots superimposed with red are painted on the walls. This combination of red and white signifies the worship of Shiva and Shakti. 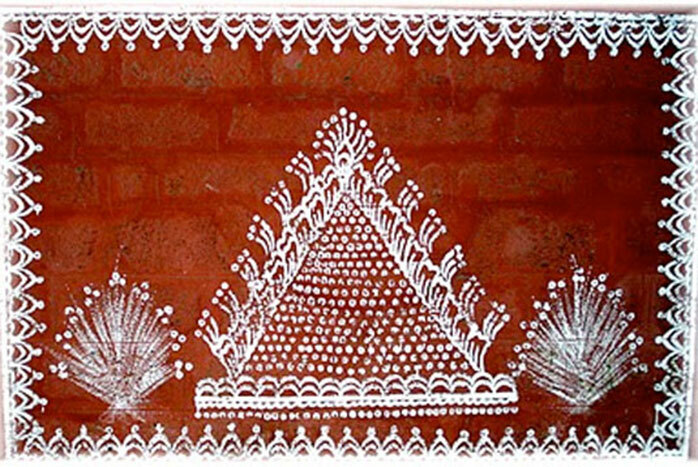 Homes in Orissa have become canvasses for creating these traditional jhotis which involve intricate line art. Despite urbanisation this agrarian tradition continues among the families of Orissa. Jhoti is considered as a means to attract goddess Lakshmi, hence prosperity into homes. 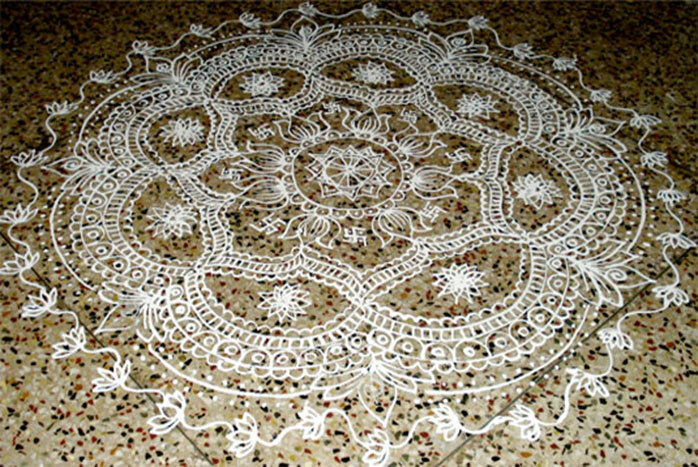 Women all over India decorate their homes with traditional patterns during festive occasions. The floors, courtyards, the inner and/or outer walls of the home, entrance to the home, are the areas that lend themselves to these elaborate decorations. 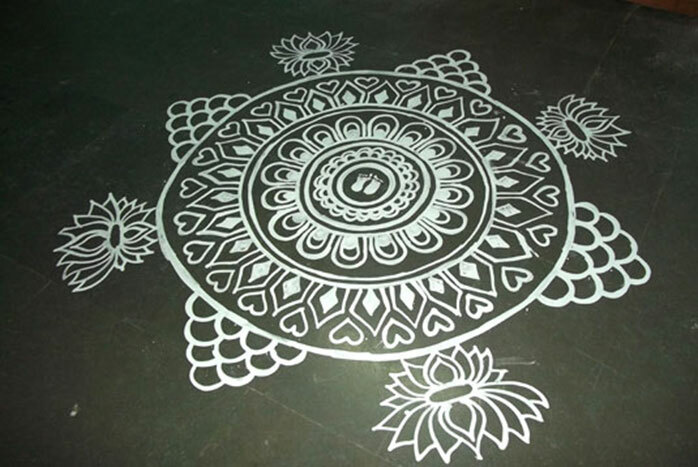 These folk decorations broadly known as rangolis are believed to bring glory to the festivals, and are indicative of prosperity and happiness. Usually these art forms are practiced by rural women, though a few urban women do the same to maintain the religious and ritual heritage associated with it. 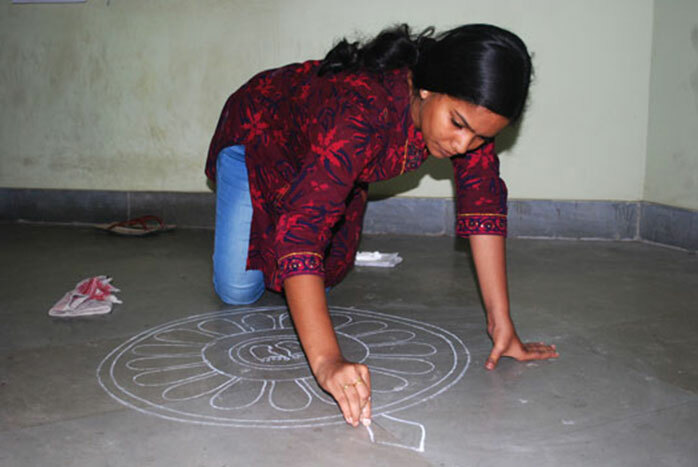 Jhoti, the rangoli of Orissa too is practised with the same sentiments. Jhotis are drawn on special occasions and are a must at festivals like, Basanti, Manabashaa Gurubaara, Kaartika, Dola, Jhulana, DhanaLakshmi puja, Gaja Lakshmi puja, etc. The festivals turn into occasions of great merriment when they include these decorations along with the preparation of traditional cuisines for the people of Orissa. The Hindu month of Margashira (November –December) is considered very auspicious when Goddess Lakshmi is invoked in every house on Thursdays. This is an important festival as it is the harvest season when the grain is thrashed and stored. The harvest of the kharif season is worshipped as goddess Lakshmi on these Thursdays. This is a traditional festival followed by the married women in every household. 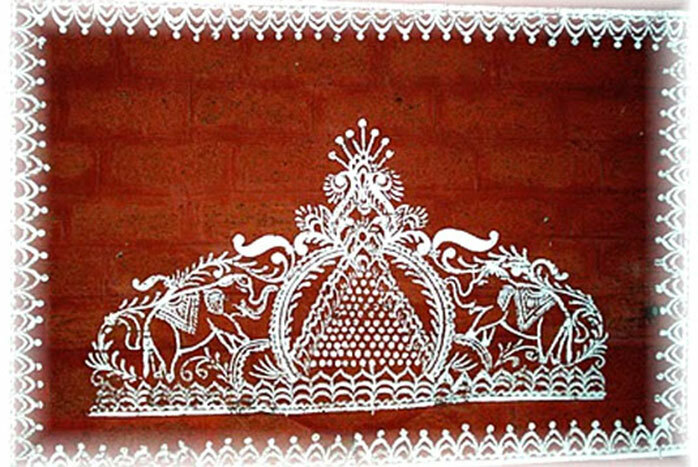 During this auspicious month, the women folk decorate their houses, entrances, with aesthetically designed motifs using the ground semi liquid rice paste or pithau. 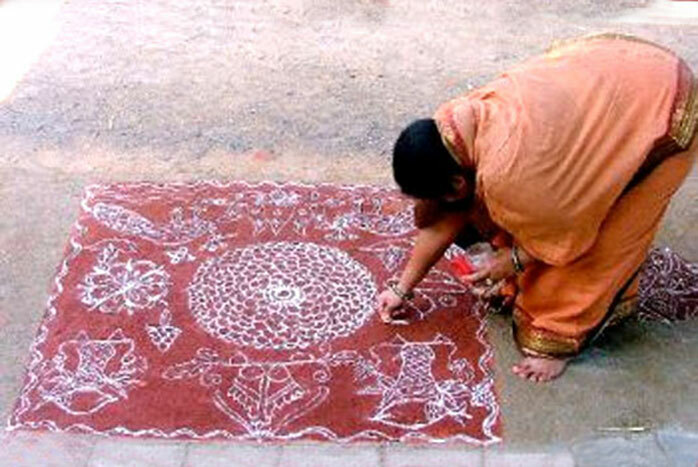 The white jhoti or chita is created on a smearing of red earth. The decorations are done on Wednesdays and the Lakshmi puja is performed on Thursdays. This is also the time when women vie each other in exhibiting their artistic skills in creating wonderful, symmetrical designs of lotus flowers, conch shell, the ‘kumbh’, peacocks, elephant, fish, and other floral and geometrical designs. 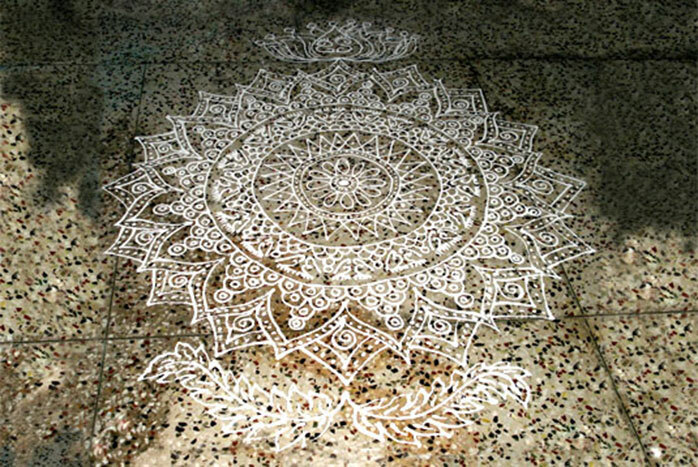 The feet of Lakshmi entering their house and other large circular designs etched on the floor are a must and are a feast for the eyes. There is a famous story about Goddess Lakshmi, which is sung in a prayerful manner by the women while performing the Lakshmi puja in the month of Marghashira. The story is all about how Goddess Lakshmi got impressed by the cleanliness, sense of devotion of a sweeper woman and blessed her with abundant wealth. In Orissa, it is believed that Goddess Lakshmi, the Hindu goddess of wealth and prosperity, visits homes in the month of Margashira. Hence the Manabasa Gurubar- a festival where Goddess Lakshmi is worshipped on every Thursday is celebrated in this month. Like most bratas, this particular Lakshmi brata, called Manabasa Gurubara brata, with which Lakshmi Purana is associated, is woman-centric. The Legend of Manabasa Gurubar is based on the ancient scripture “Lakshmi Puran”. The untouchables were not allowed to pray, worship and perform rituals to the gods and goddesses in the ancient ages. It was in this era that Sriya, a woman from the lower caste dares to pray and worship Goddess Lakshmi. Eventually she wins over the goddess of wealth and gains her support. Though Goddess Lakshmi ends discrimination amongst people on earth based on their caste and encourages the untouchables to conduct rituals and worship to gods/ goddesses she is forced to move away from her home and her consort Lord Jagannath, by his brother Lord Balabhadra. As Goddess Lakshmi moves out of Lord Jagannath's home, both Lord Jagannath and Lord Balabhadra undergo immense suffering including starvation without water and food. The curse of Goddess Lakshmi had a severe impact on both the brothers for 12 years and they had a tough time. This is when they realised the importance of Goddess Lakshmi and were keen to bring her back to their home. Goddess Lakshmi agreed to return to Lord Jagannath's house on one condition, that there no longer will be any caste based discrimination on earth. It is only in the end through the divine sage, Narad Muni it is revealed that Lord Jagannath to end discrimination based on caste from this earth, set up these series of events which highlighted the social message, along with the strength of true spirituality. This story gives message to the society that women should be respected, given proper attention and care. A house becomes home only due to a woman. This is the reason why women are considered as the Lakshmi of a home. When a woman is disrespected all the glory and happiness vanishes from the house. It reflected the reforms and progressive stance of Gods from the ancient times. The other message is of social equality, that everyone has the right to become wealthy and gain fortunes by their hard work and diligence and that social structure based on caste and discrimination of people is an unfortunate manmade procedure. This unique story highlights the fact that in the eyes of the creator, everyone is equal. The story not only draws ones attention towards discrimination but also gives a message of Women Empowerment. According to Oriya scripture, Goddess Lakshmi is worshipped on every Thursday during the Oriya month of Margasira. During this period the houses are kept neat and clean by the Oriya women. Special pujas are offered to Goddess Lakshmi , with utmost devotion. The women wake up very early in the morning on Wednesday and clean the homes, doorsteps as well as the entrance and decorate them with Jhoti or Chita to welcome the Goddess Lakshmi . It is believed that Goddess Lakshmi never visits a house if it is untidy and dirty. The decoration also includes placing the measuring equipment - a jar made of bamboo/ cane used in the earlier days for measuring paddy (known as Mana) in the centre of the large circular jhoti that is madenear the puja altar. It is filled up to the brink with newly harvested paddy. This mana is a symbolic representation of the bountiful and generous Goddess Lakshmi. It is believed that Goddess Lakshmi visits every house during this period. This puja is performed on all the 4/5 Thursdays of that month. The celebrations conclude with the preparation of the tasty Oriya cuisine like Manda Pitha, Khiri, Kakara, Chitau, etc., that are prepared and distributed to neighbours. On this day all Oriya women read or sing the Lakhmi Purana with utmost devotion. This marks the end of this auspicious occasion. Lakshmi Purana has two parts; the first part is the poor, low-caste woman Shriya’s story and the second, goddess Lakshmi’s and her consort Jagannath’s. The first part contains an ethical code, and the second, a corrective to it.Lakshmi Purana is a narrative based on a domestic conflict and the housewife is the heroine here. She is shown to be central to the family; she can break her family or bring it happiness and prosperity. There are do’s and don’ts mentioned in this purana which relate to what would please goddess Lakshmi, but most of these are statements about living in accordance with dharma. 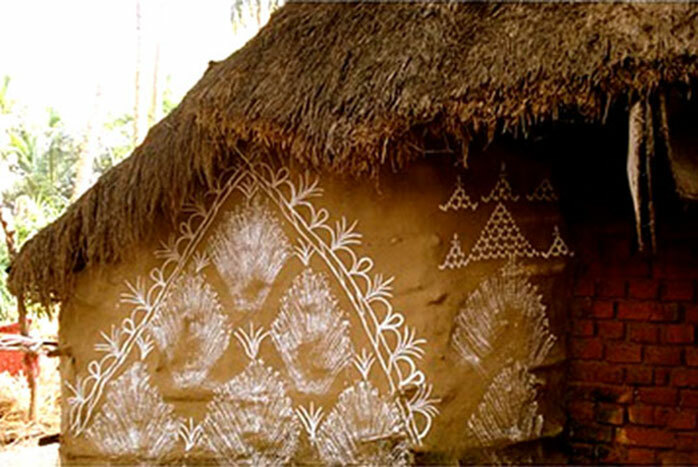 It is a common practice for the rural women in Orissa to draw several figures and flower patterns on the mud walls of their thatched homes. They are very beautiful to look at. An earthy red colour called “dhau” is smeared on the walls and then the jhotis are created which provide a wonderful contrast. 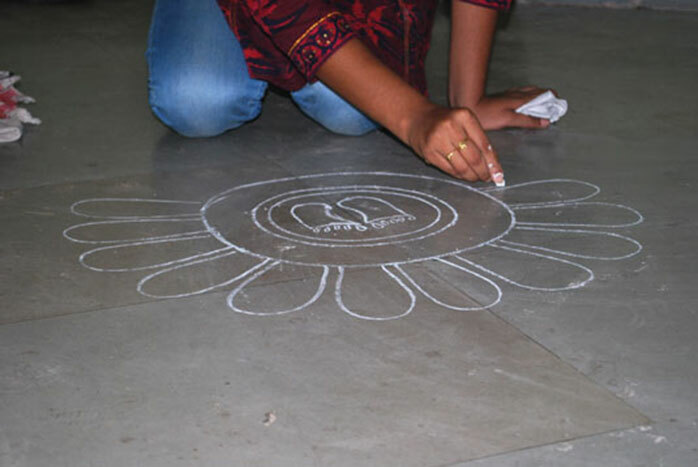 “Dhau” is also used by few people while drawing Jhotis on the floor as the background colour. 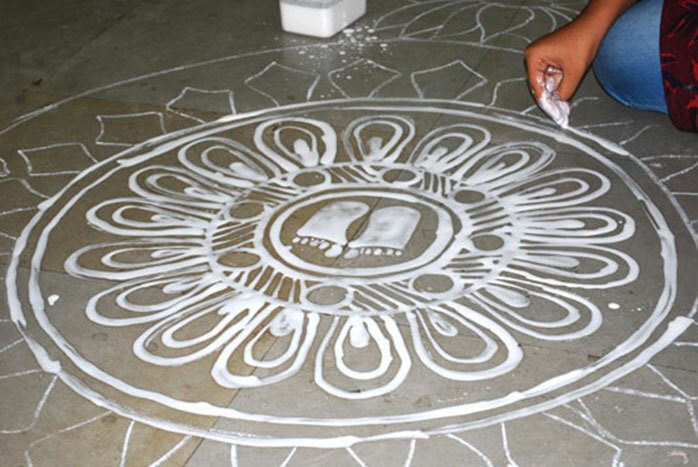 To draw a jhoti or chita, the fingers are dipped into the semi liquid rice paste and made to trace out intricate patterns on the floor or walls. Sometimes a kind of brush is prepared from a twig with a small piece of cloth attached at one end. This is dipped into the white, semi liquid rice paste to draw patterns on the wall. 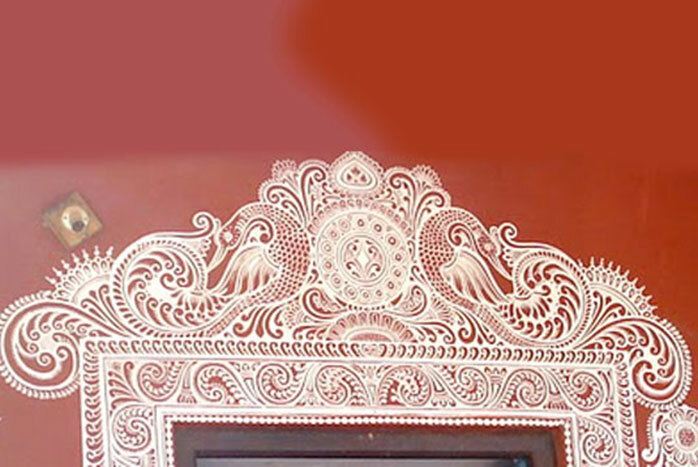 At times, the paste is sprinkled on the walls with delicate swirls of the wrist and a pattern resembling bunches of paddy emerges on the wall. An example of this is shown below. A jhoti created on the outer wall of a hut. It has a number of Dhana shishaas (the heaps of paddy after it is winnowed) in a triangular form. The Dhana shishaas are drawn by sprinkling the semi liquid rice paste through finger nails by gently swirling the wrist to create long lines and the dots at the top are made using fingertips. A wall jhoti or chita drawn around a door having two peacocks as strong design elements. The wall jhoti or chita shown below is based on the concept of four adornments of Lord Vishnu or Lord Jagannath namely Sankha (the conch shell), Chakra (the wheel), Gadaa (the mace) and Padma (the lotus) and also there is the symbol of prosperity (Dhaana Shisaa) depicting the presence of Goddess Lakshmi on both the sides of the conch. The wall jhoti or chita shown below has a triangular element that is created by dots that are created using the finger tips. Also there are two Dhaana Shisaas created on either side of the central element, which indicate prosperity. A wall jhoti seen below has two elephants along with the other design elements. Laxmi Paada Chita: The jhoti shown below is called Lakshmipaada Chita or the "feet of Lakshmi" as tiny representations of the feet of of goddess Lakshmi are drawn inside the body of the Jhoti. Pidhaa marei: Pidhaa means a small piece of wood that is used for the purpose of sitting. Mahalaxmi would be seated on a Pidhaa which would be again decorated with Jhoti, muruja and flowers. In the Jhoti shown below there is a decorated pidhaa marei on which Goddess Mahalakshmi is seated. 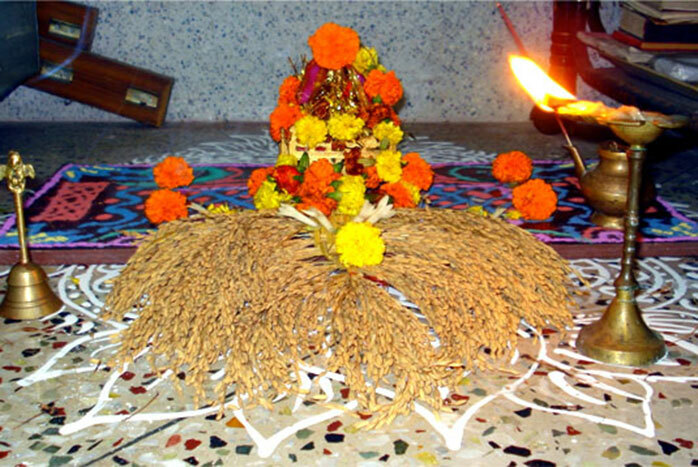 Flowers, sheaves of paddy and lighted lamps are offered to the goddess during the puja. 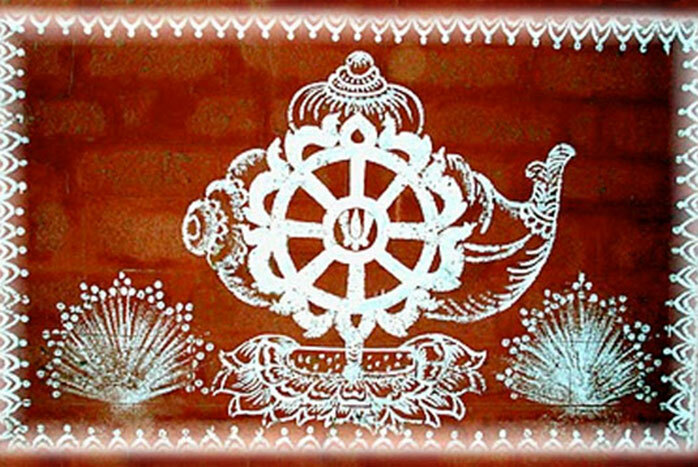 Swapna Padma Chita- This type of jhoti or chita is circular and very large as well as elaborate in design. It requires a lot of concentration and time to execute it. The jhotis may also be drawn on grain bins, on “manna”- measuring equipment made out of bamboo/cane used in the kitchens, at or around the “dhana kotti”-storage area for the grains, on small pavilions for household deities, on the threshold of homes and on earthen pots used during marriage and on other auspicious occasions. Once these jhotis are created one walks around them and does not walk over them as they are offerings to the goddess Lakshmi. Also after the completion of the festival or the special occasion, these are not swept away with a broom, but are wiped clean with a wet cloth. 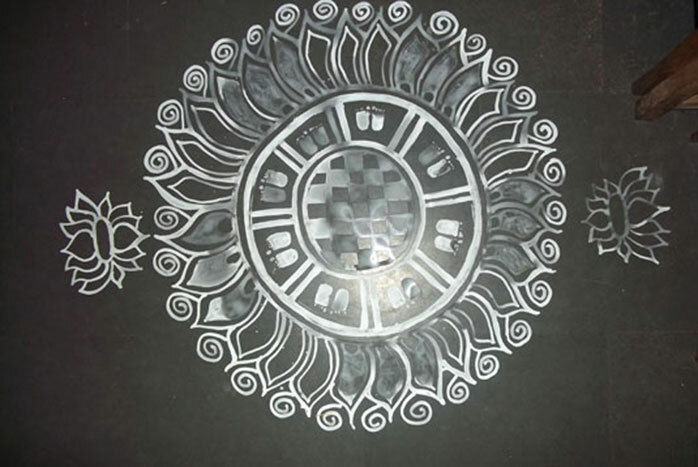 Muruja : Along with jhotis another format of rangoli known as “Muruja” is also used in Orissa. Muruja is generally used during rituals in the forms of 'Mandalas'. In the holy month of 'Kartik' (November) women observe penance and draw Muruja designs near the 'tulsi' plant. Drawing of the muruja designs needs a lot of skill and practice. 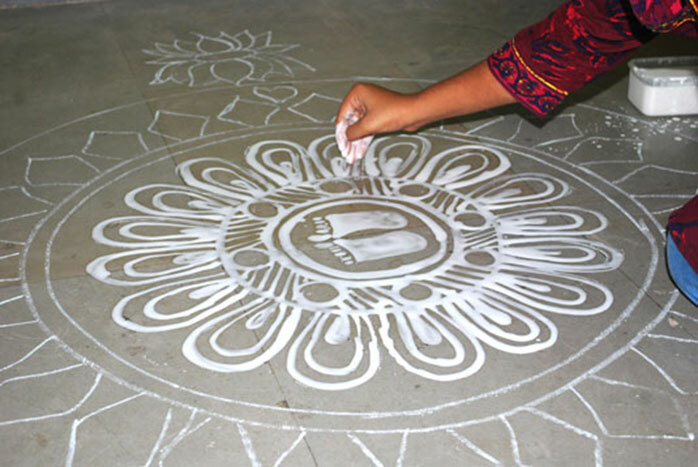 Muruja or rangoli is drawn on the floor with powders of different hues, with the help of fingers .Rice powder or fine sand is used in these creations. The powder is held between the tips of the thumb and the forefinger, and allowed to fall delicately through them to form lines and patterns. Colourful powders are obtained from natural sources. White powder is obtained from the grinding of stones, green powder is obtained from dry leaves, black from burnt coconut shells, yellow from the petals of marigold flowers or turmeric, and red from red clay or bricks. Some women make the muruja with just flowers. The art of creating Jhotis is passed on down the generations, with the older generations being more proficient at making them as they were practised more regularly by them. The modern day sees a diminishing knowledge and practise of this art form. 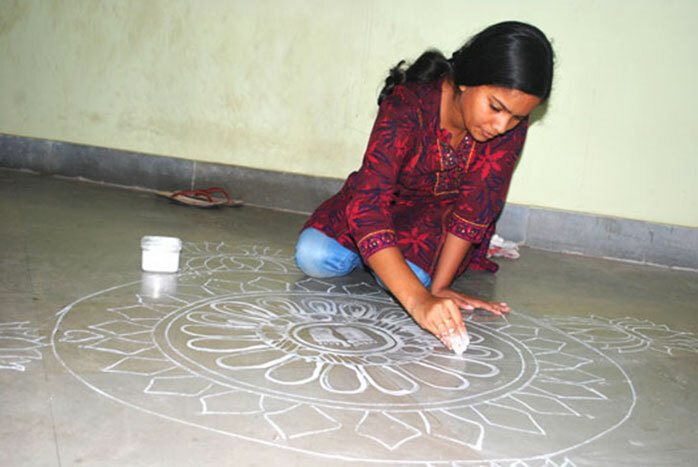 Ms. Manisha Ray from Orissa, is a talented artist who believes in the art of Jhoti , Chita and creates them during the Lakshmi puja days and special occasions at her home with ardent devotion. 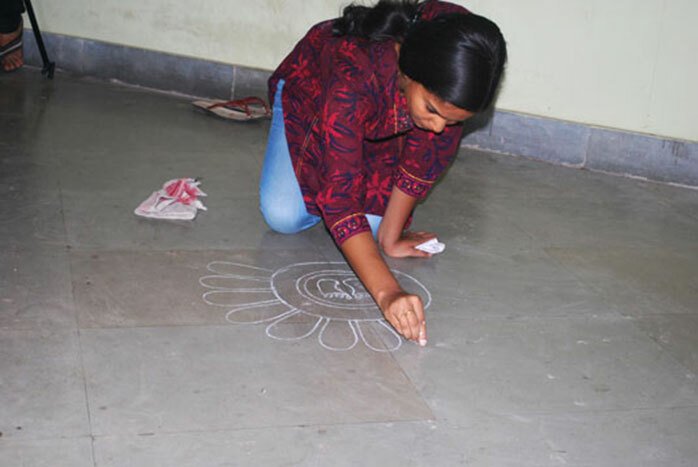 She has been observing her grandmother, her mother, and her two older sisters create these jhotis all her life and has been inspired by them to learn and practise this floor art. She has participated in a number of rangoli competitions and won several prizes for her excellent jhoti renderings. A few such jhotis created by her at her home are presented below. The precision and the accuracy in terms of proportion and the rendition of minute details can be seen in her jhoti presentations. 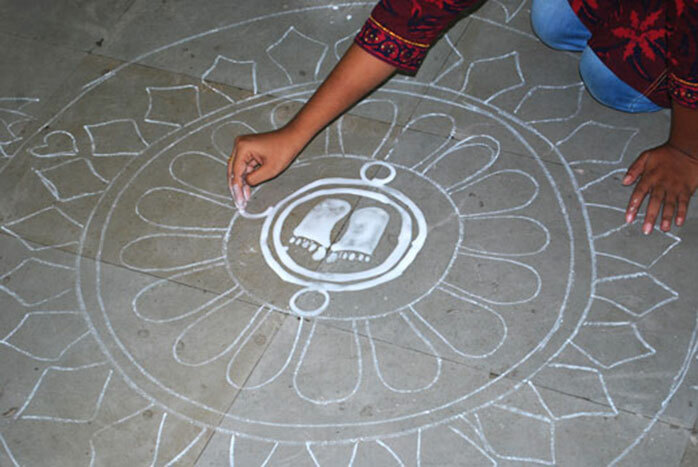 In a documentation exercise at IDC, IIT Bombay, Ms.Manisha Ray created a large circular jhoti that is specifically drawn during the Laksmi puja days. At the centre of this jhoti is the “Lakshmi pada” which represents goddess Lakshmi entering a home and being revered. 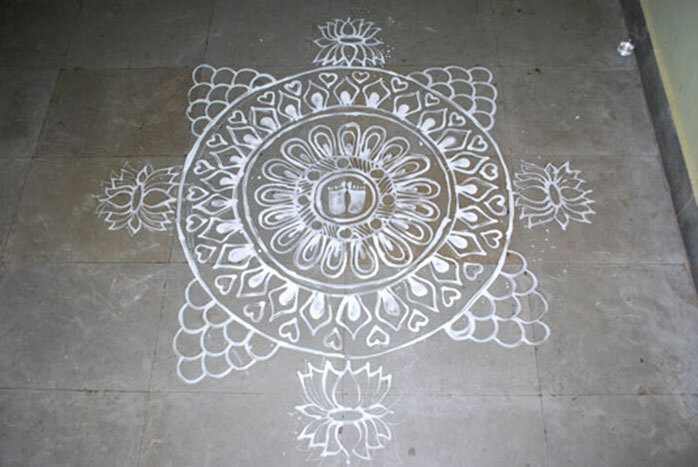 This can be drawn in the verandah, the courtyard, or at the puja place of a home. The symbol of the lotus is frequently used in this jhoti to associate it with the goddess of prosperity who is usually adorned by them and is also seated in one. No colour other than the white of the semi liquid rice paste is used here as this is a sacred jhoti. It can be made on a plain surface or on a surface over which the red coloured earth or dhau is smeared. Depending on the size, intricacy of the jhoti and skill of the creator, the creation of these jhotis can take an hour or several hours. 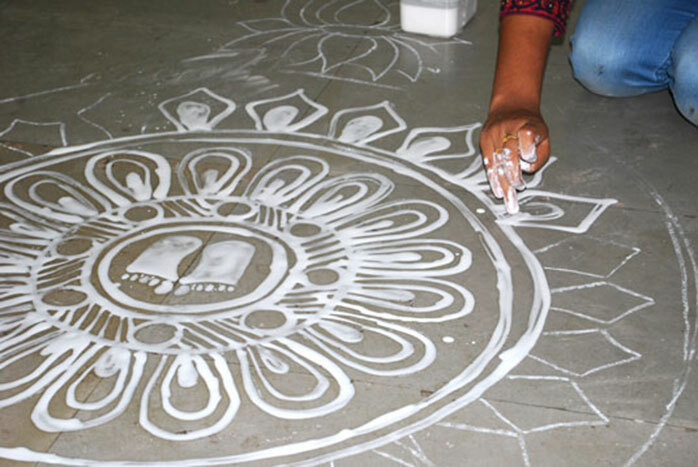 Manisha first created a rough outline of the jhoti using white chalk and then used the semi liquid rice paste deftly with her fingers to create this beautiful jhoti or chita. 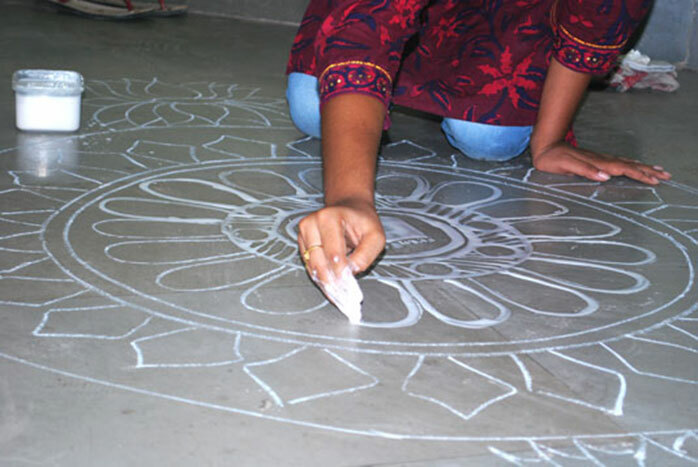 The following images show the various steps that led to the creation of one such jhoti by Ms. Manisha Ray, at IDC to demonstrate the beauty of this floor art. A video documentation of the creation of this jhoti by Ms. Manisha Ray is presented below, which captures the creative process more deeply. 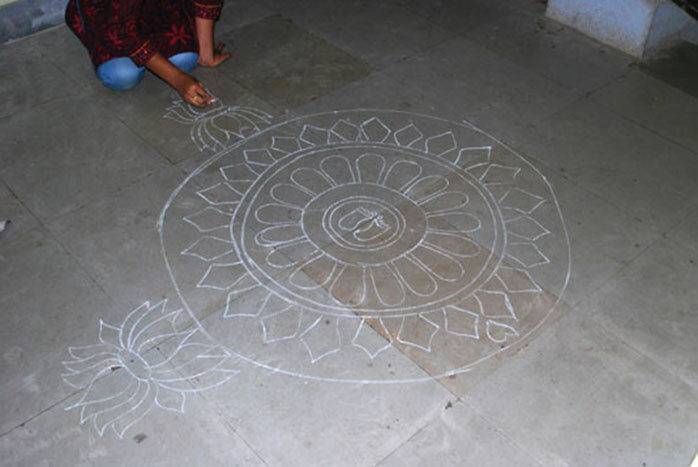 Though they once adorned houses or the tulasi choura (holy tulsi/basil plant) on a daily basis, the adornment by jhoti and chita, also known as rangoli, are today seen only during festive occasions. 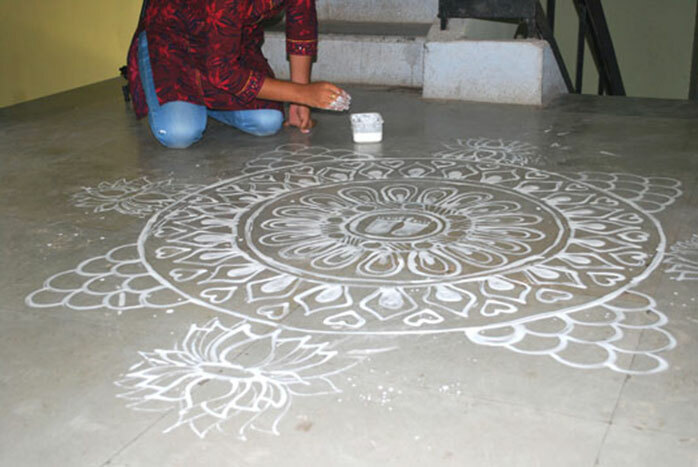 In this modern day these are practiced more by rural women on a regular basis compared to a few urban women, who do so on festivals or during rangoli competitions. 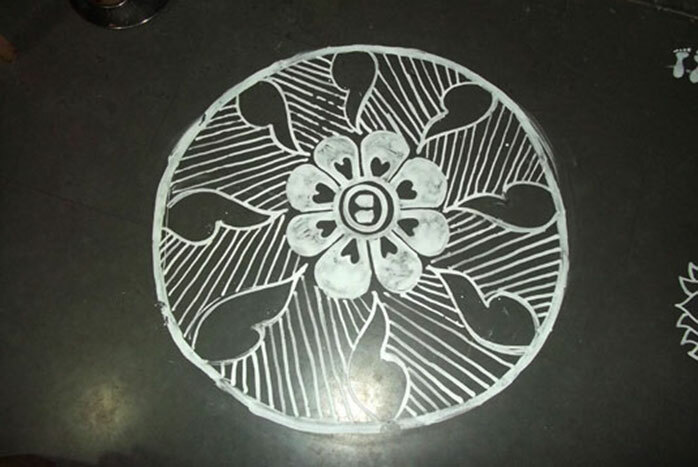 Also in urban areas, geometric patterns on wooden grids are being used to draw jhotis and the rice paste has been replaced by white chalk powder. 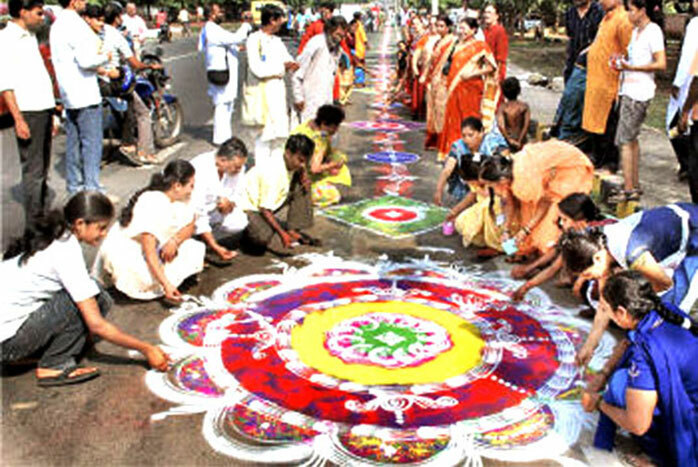 In order to preserve and promote this folk art, cultural organisations like the Orissa state chapter of Sanskar Bharati, a prominent cultural body of the nation frequently conducts rangoli festivals in Bhubaneshwar, the Orissa state capital. 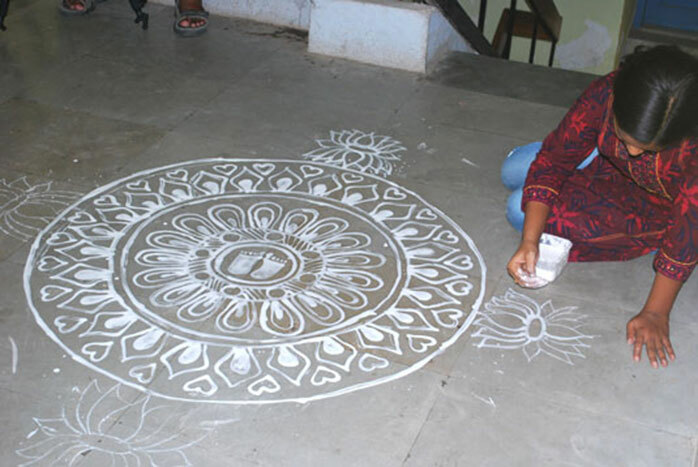 In one such festival, there were workshops and discussions on the various trends and traditions of rangoli across the country. 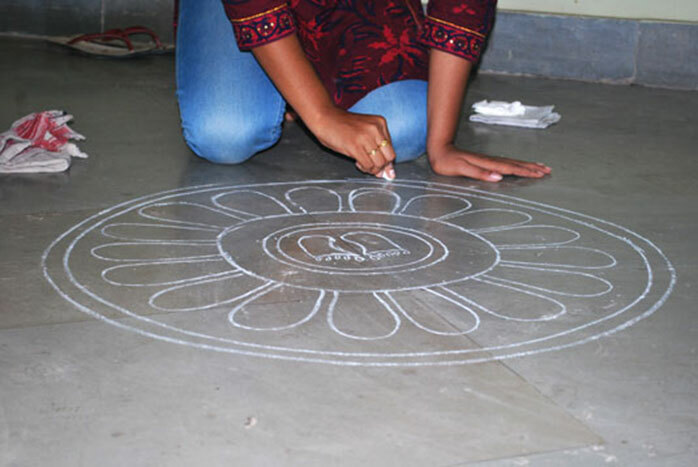 The experts demonstrated the salient features of rangoli as being practised in Gujarat, Andhra Pradesh, Tamil Nadu, Chhatisgarh, Maharashtra, Kerala, West Bengal, Rajasthan and Orissa. 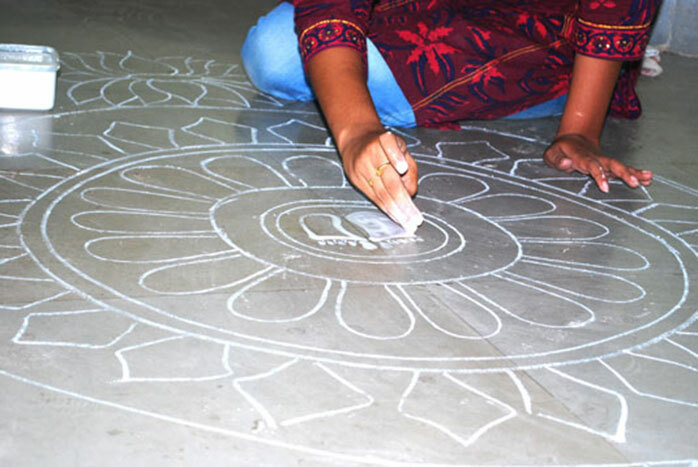 The discussions revealed how rangoli is not merely a folk art but that it carries a cultural legacy that is deeply woven around the life and times of the people. 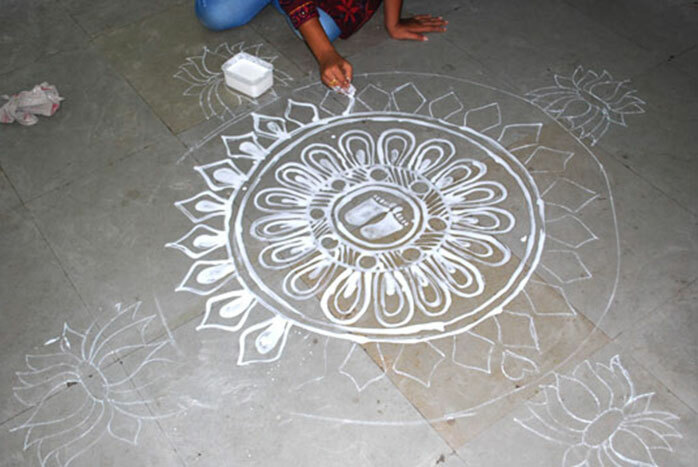 Women from different states of India create rangolis, jhotis to promote the Indian culture and tradition. Sometimes a particular street is decorated end to end by the workshop participants with a wide variety of rangoli designs that enlighten and delight the passersby about this art. 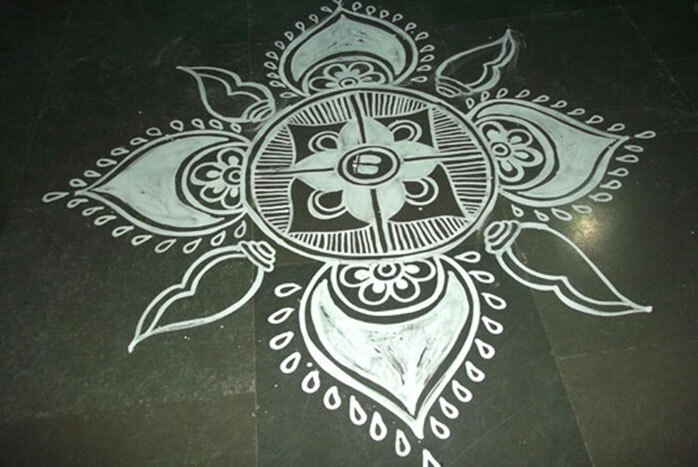 The objective of such festivals is to make the masses aware of India's ancient art tradition of rangoli that is being marginalised with the onslaught of the so-called modernism. Such events remind us of the fact that our art traditions are deep rooted in our culture. The Bhubaneswar Development Authority too, has participated in one such encouraging exercise. They painted the associated walls of roads in Bhubaneswar with the traditional wall Jhotis or Chitas, as a result of which the looks of Bhubaneswar are enriched. In Cuttack too, a bank and another marine company have taken similar steps to paint the walls of a ring road, which has brought glory to the Cuttack city. Since the jhotis are usually created to welcome the goddess of prosperity - Lakshmi, it seems as if Bhubaneswar and Cuttack too have a similar agenda.